Paciffic Direct to take delivery of their only "NEW" Aircraft !! . . . . . Flight Plans now available . . . Happy flying. . . 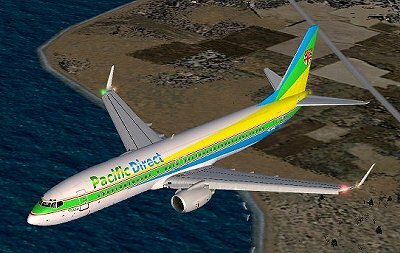 This may well be the last time that Paciffic Direct will be able to afford new aircraft ! So please be gentle with them fellas - It would be nice to have the Press taking pictures of aircraft complete with Flaps, Landing gear etc. For those that are interested it is quite easy to tell the different aircraft apart. DQ-PDE (above) is the BOEING 737-800 WITHOUT winglets. DQ-PDF (left) is the BOEING 737-800 WITH winglets. These ferry flights are quite straight forward, and should present no problem if you've just flown over the Himalaya's in an ATR !! 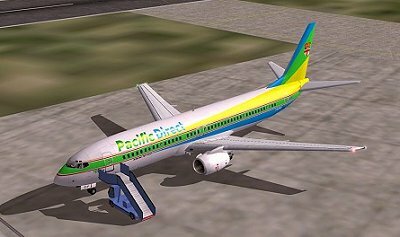 Now - these aircraft are all FS9 & FS2k2 models - So they should work for all of you. hosted by Mark 171's Planecrazey Site.